I'm pretty sure it should not be used in any formal way, such as in an article in the better magazines or newspapers. But I assumed everyone is familiar with it, sorry. There really are four: the Dollar, the Euro (how do people not laugh when saying such a ridiculous name?? ), the Pound Sterling (sort of) and Bitcoin. Yes, I know what's wrong with what I said. Summers cites a study just published by researchers at Harvard business school arguing that eliminating large denomination bills would have little downside for legitimate commerce, but it would make life far more difficult for those breaking the law. The report calls for the end of not only the $100 bill, but also the 500 euro note, the UK's 50 pound note and the 1,000 Swiss franc note. The £50 banknote is worth $72 today. The newest issue, with Matthew Boulton and James Watt, was issued 11 February 2011. A total of only 440 million pieces were produced over a 4 year period, and about 200 million are circulating. The £50 banknote = CAD$99. At the end of 2014 Canada was circulating 373 million of their $100 banknote. The Swiss are circulating 41.8 million of the 1000CHF banknote (£50 = 71.3 Swiss Francs). The £50 banknote is chump change compared to the over 600 million 500EUR banknotes (plus the 100EUR and 200EUR banknotes), the 10.8 billion US$100 bill, and the over 9 billion 10,000JPY banknotes in Japan (£50=8,000JPY). As of 10 March Euro-zone has finally matched Japan and dropped it's central bank interest rate to 0%. How far away are the USA/Canda/Britain? I am not quite sure how Norway manages to keep there rate at 3/4%? I am posting this under the $500 banknote thread, because the Narrow Money Supply M0 in the United States increased to $3.87 triillion in February 2016. Currency in circulation is $1.4 trillion as of February 18, 2016 but a significant amount is overseas. Should interest rates in USA and Canada follow Europe to zero (or even negative) many people would prefer to turn their bank accounts into cash. Countries with higher rates like Mexico have to be balanced against the potential for the currency to drop in value relative to the USD. The 500 Euro note will no longer be produced. Interesting comment by an economist that this penalizes regular folks who would prefer to store their wealth in the form of large bills at home, instead of leaving it on deposit in a bank where the possibility of negative interest looms. Meh to him, I made that point nearly 3 months ago here! In the 14 months since it was announced that the 500 Euro banknote would not be introduced into the next series of notes the circulating supply has dropped 13.3%. Although the head of the ECB has stated that he would like to demonetize the old 500 Euro banknotes so that they are all turned into banks, there is heavy political resistance. In any case, the actual supply of cash has not been reduced, and a very large order of 200 Euro banknotes of the new series was placed. Since the introduction of the Euro banknotes, the 200Euro denomination has not been very popular (just like the $50 is not very popular in the USA). In most countries the largest banknote is used for "store of value" and "buying and selling used automobiles or similar purchases" as well as illegal activities. So the Euro zone has no intention of following Sweden's lead. Back in the USA they are still having trouble producing reliable color $100 banknotes in the current quantity. A total of 1.44 billion c-notes of the 2009 series were produced from Feb 2010 until Sep 2011 when that series was completely abandoned in favor of the 2009A series. It was a very costly mistake that threatened the security of the cash supply.A total of 7.1904 billion $100 banknotes of the 2009A series was produced. From Nov 2014 until Mar 2015 the new 2013 series of color $100 banknotes began to be printed. Manufacturing problems once again shut down the supply and it was not restarted until Feb 2017. About four million of the $500 banknotes were produced in the 1928 and 1934 series (an insignificant number compared to today). The cash supply of the federal reserve notes was increased from $4 billion to $23 billion from 1938 to 1945 as we fought WWII. The cash supply was about $45 billion in 1969 when the decision was made to destroy all $500 banknotes that came into possession of the central bank. The cash supply was about $45 billion in 1969 when the decision was made to destroy all $500 banknotes that came into possession of the central bank. "Investopedia states that the $500 bill featured President William McKinley and was last printed in 1945. The bill is still legal tender as of 2014, but any $500 bills received by the Federal Reserve are destroyed." Who would be stupid enough to take one to the bank, a good one in worth $3000, and a bad one $800. A few dozen are destroyed every year. I don't know if they are in such bad shape that they are worthless on the collector market, or if people are too lazy. There are still roughly 350 apiece of the $5000 and $10000 banknotes. Benny Binion had a hundred of them for his display, but his daughter sold them. I have to believe that their value as collector items is reinforced by the fact that they are still legal tender. I didn't realize that the old German Deutschmarks can be exchanged for Euros in perpetuity. I think you have to mail them to the central bank, as local banks don't accept them anymore. I know that older Germans keep them out of sentiment, and they even have special markets where you can purchase goods with the old DM banknotes. There are still about 3/4 million Canadian $1000 banknotes in circulation since the year 2000. They will be legal tender forever. The rumors are that criminal elite still possess most of the notes, as they are not worth that much as collector items. The €500 banknote went from a high of 614 million notes down to 532 million in the 14 months that the ECB decided they would not be included in the new series. The Euro Zone has replaced the €5, €10, €20 banknotes so far (less than 40%) and they will start on the €50 banknote next. 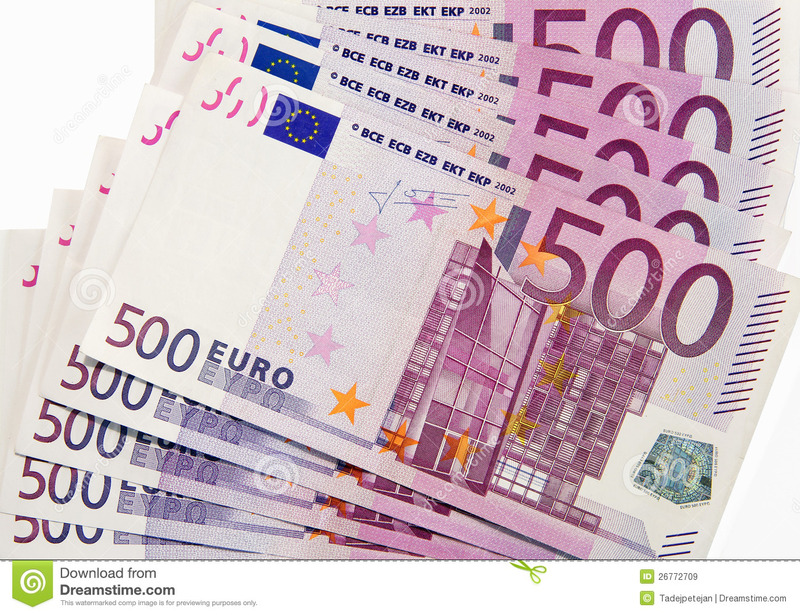 The €50 is by far the most popular denomination, and constituted almost half the banknotes in circulation (over 9 billion). Next year they will replace the €100 and €200. Political resistance is still very high to demonetize the old notes. The £50 banknote has not been schedule to be replaced by a new polymer note so many people believe that it will never be replaced. As it is only worth US$62 many people feel that it is essentially an invasion of privacy to eliminate it. A £20 banknote is worth US$25, which is less than the current value of Mexican 500 peso banknote (US$26.65). Poland just released (10 February 2017) a 500 PLN ( Zloty) banknote worth US$127 as they decided that the 200zl banknote wasn't valuable enough. So not everyone is into the anti-cash movement.